If I'd known how easy cooking pork ribs is, I would have started cooking them years ago! But I just learned to cook them recently - and they are now one of my family's favorite meals. 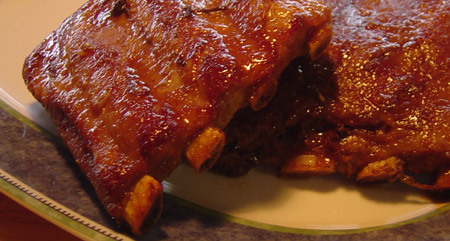 Allow yourself lots of time to make these delicious oven baked ribs. Although the prep work is very simple, you'll need to allow an hour for the ribs to boil before you can put them into the oven. You can use any variety of pork ribs in this recipe: baby back ribs, spare ribs, or whatever is available at your butcher or grocery. Cut the pork into 3- or 4- rib pieces. Place them, and the onion, in a large pot. Reduce heat and boil gently for one hour. Meanwhile, put the barbecue sauce, water, Worcestershire sauce, cider vinegar, honey, salt and garlic into a small bowl. Let this sauce stand while the ribs continue to boil. Put the ribs into a large baking dish. Pour the sauce over them, and put them into the oven. Bake for 30 minutes, turning once. Make your own homemade barbecue sauce. Experiment with different sweeteners. How about brown sugar, or maple syrup, or molasses? For spicy ribs, add a dash or so of hot pepper sauce. Provide each person with a moist cloth for wiping fingers. You'll want to use your hands to eat, and they will get messy!